Arcola Church's Care Ministry offers care and support for those in our congregation and community. Whether you are ill, homebound, hospitalized, need support or friendship -- we are here for you. For we believe that healing and care lead to a more compassionate life. Prayer Requests go to our prayer group, Director of Caring, Molly Riedel, and Pastor Chris Riedel. This ministry is led by Samantha Girardi. Counseling is available to those in our congregation who are going through a spiritual and/or life changing event or crisis. Counseling involves a caring relationship in which one person seeks to help another deal more effectively with the stresses of life. At Arcola Church we have a group of wonderful Congregational Care Ministers and a counselor (Molly Riedel) that meet at our church. To learn more about Molly, go to our staff page. Contact Pastor Chris Riedel or the Director of Caring, Molly Riedel, for more information and to connect with a Congregational Care Minister. We offer different support groups throughout the year. Alcoholics Anonymous meets regularly on Thursday evenings at 8pm and Sundays at 6:30pm in our Chapel building. In addition, we periodically offer grief, illness, caregiver, widow/widower, Divorce Recovery and other groups. Angels on Call (AOC) provides short-term/emergency meals and transportation for our Arcola Church familes in crisis. If you or your family need help, or you are interested in joining this ministry, please contact Molly Riedel, Director of Caring. Arcola Church hosts blood drives 2-3 times a year on a Sunday morning from 8:30am to 12:30pm. To make an appointment at our next blood drive and save a life, click here and type in sponsor code 7108 or contact Karen Michaels to schedule your appointment. Walk-ins are welcome too! Our card ministry provides cards to those in need of encouragement. To become a member of the Words of Care team, please contact Molly Riedel, Director of Caring. Prayer cloths are pocket size prayer cloths that represent God's love, you will find them in the church lobbies - take one for yourself or to give to a friend in need of comfort. If you'd like to join the team that makes them, contact Sherry Cosby. Baby blankets are handmade by talented people in our congregation to welcome our newest and smallest members in our congregation. If you would like to join this team or tell us about a new baby in the congregation, please contact Molly Riedel. A prayer quilt is a quilt that is made with love and tied with prayers. Each knot tied into the quilt represents a prayer that is offered specifically for someone in need of those prayers. As the congregations or other groups, family, and friends gather, knots are tied into the quilt representing prayers, love and concern for the recipient. Most of the time, this happens around the weekly worship service, with recipients lifted in prayer, and an invitation extended to the congregation to tie a knot representing their prayers. Any person in physical, emotional or spiritual crisis who feels like they can benefit from being "covered in prayer" can receive a quilt. Sponsors are responsible for ensuring the recipient of the prayer quilt is willing to accept the quilt and the prayers, and will be talking to the recipient about how the congregation may direct their prayer efforts on his/her behalf. The sponsor will also ensure that the quilt gets to the recipient after it is tied. This ministry is led by Cheryl Hershey. 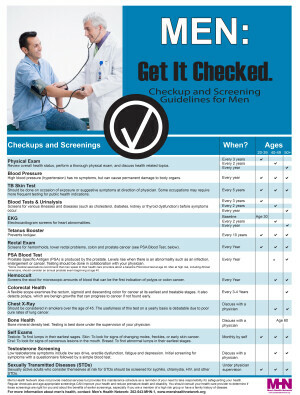 April is men's screening month. Thanks to Phil Mowery for providing these checklists.